Whose pieces stayed at home? Some tie-break systems aren't as good as others. At the end of the 4th day of the 2011 Sydney International Open, FM Akshat Khamparia still holds on to the outright lead, with 6.5/8. However there is a large pack of players in hot pursuit, with GM Zong Yuan Zhao, GM David Arutinian, GM Andrei Deviatkin, IM Kevin Goh and IM Stephen Solomon all on 6 points. Tomorrows final round sees Khamparia have the black pieces with against Zhao, while Goh plays Arutinian and Deviatkin playes Solomon. Today saw more upsets of the top seeds with GM Sune Berg Hansen losing his round 7 game to FM Greg Canfell. This win by Canfell, plus his round 8 draw against FM Junta Ikeda, means that Canfell can earn an IM norm tomorrow, if he beats New Zealand FM Michael Steadman. IM Stephen Solomon also pulled of an upset win over GM Dejan Bojkov in round 8, wining an ending a pawn down, in typical Solomon style. In the Challengers event, the joint leaders are Harry Press and Tony Davis, on 6.5/8. Curiously they played each other in the first round of the tournament, with the game ending in a draw. In the final round Davis is paired against Richard Voon, while Press plays Patrick Behan. The final round for both events starts tomorrow at 9:30 am at the Parramatta Town Hall. Live coverage of the top 8 games from the Open can be found at the Parramatta Chess Club website. Tied for second are GM Andrei Deviatking, GM David Arutinian and FM Chris Wallis. Wallis defeated IM Stephen Solomon on the afternoon round, and a strong finish may leave him with an IM norm. However he first has to overcome GM Deviatkin in tomorrow mornings round. the position. Hansen looked like he was playing for tricks but it all went terribly wrong. In the Challengers tournament, top seed Maros Zajac leads by half a point from Ian Dickson and Harry Press. Press plays Zajac in the first round tomorrow, while Dickson is up against Tony Davis. The 2nd day of the 2011 Sydney International Open began with the surprise pairing of Hansen v Zhao on board 9. The top two seeds obviously had an eye on their tournament future, as the game was quickly drawn. However the top boards were a little more combative, with FM Chris Wallis beating FM Vladimir Smirnov, FM Ashkat Khamparia beating GM Darryl Johansen (for the second time in a week), and FM Greg Canfell surviving a strong attack against GM Dejan Bojkov to draw. There were further upsets in the 4th round with FM's Khamparia and Wallis being the only players to reach 4/4. Half a point back are GM's Deviatkin and Bojkov as well as IM Kevin Goh. In the Challengers event, Maros Zajac and Ian Dickson lead with 4/4, half a point ahead of Dennis Wan. With a large group of players on 3, it mat still take a couple of rounds before the likely winner of this event emerges. An interesting set of results on the first day of the Sydney International Open sets up an exciting third round tomorrow morning. Top seed Sune Berg Hansen was beaten by Velimir Kresevic from Germany, while second seed Zhong Yuan Zhao drew with Andrew Brown. With one of them on 1.5 (Zhao) and the other the highest rated player on 1 (Hansen) , the draw sees them paired together way down on board 9. The top 3 boards now see some promising Australian FM's (Ly, Illingworth and Canfell) up against a trio of Grandmasters (Arutinian, Deviatkin, and Bojkov). The Open section ended up with 68 entries. while the Challengers had 52 players. All the results, pairings and live games can be found at the Parramatta Chess Club page. Just click on the Sydney International Open link. The 2011 Sydney International Open is up and running, with Round 1 of the Open and Challengers both still going as I type this. However a number of games have already finished, including this sparkling effort from Chris Wallis. The 2011 Sydney International Open starts tomorrow at the Parramatta Town Hall. There are 72 players in the Open and 47 in the Challengers. Top seeds in the Open are GM Sune Berg Hansen, GM Zong Yuan Zhao and GM David Arutinian. While the Sydney event is smaller than the recently finished Doeberl Cup (the restart of the school term being partly to blame) it is a little stronger at the top with Zhao, Smirnov and Bjelobrk joining the players backing up from Canberra. As a warm up, the City of Sydney Blitz tournament was held at the tournament venue. GM Arutinian won the tournament, ahead of FM Junta Ikeda and IM Stephen Solomon. 38 players took part, with 12 players over 2000. Details of the tournament (results,pairings, live games etc) can be found at the tournament website. Results and draws for both tournaments will also be posted at www.chess-results.com. "Sheer hard work" is probably the phrase that best sums up the 2011 O2C Doeberl Cup Premier. I'm not talking about the organisational aspects, but the effort the players themselves put in over the 9 rounds. There were a couple of standout games in this regard, with Solomon v Steadman (Rd 5) seeing Solomon recovering from the wrong side of Q+Ps v 2N+Ps to eventually mate with 2NvP, whole Johansen beat Ly in a R+B v R epic that lasted over 6 hours. Even the final round games were tough with only 1 draw on the top 5 boards (resulting in three players picking up some extra money from the "Fighting Fund"). Russian GM Andrei Deviatkin proved to be the toughest of the tough, winning his final game and the tournament. He scored 7.5/9, drawing with the next 3 place getters (Bojkov, Hansen and Smerdon), and winning the rest of his games. He played 5 of the top 6 finishers, and had a performance rating of 2650. In second place were GM's Dejan Bojkov and Sune Berg Hansen. They were both undefeated, but conceded one more draw than Deviatkin. From a local (Australian) point of view there were a couple of outstanding performances. Eugene Schon went into the final round playing for an IM norm, although having to play the top seed (GM Hansen) with black was just a step to far. His score of 6/9 was still good enough to win the Bedi Cup for the best Australian Junior, and the $1000 prize that went with it. FM Max Illingworth continued his good form in the Thailand open with a win over FM Bobby Cheng in the final round to finish on 6.5/9. While this wasn't enough for an IM norm, he still picked up 18 ratings points. Final results from the Premier can be found at the O2C Doeberl Cup website or from Chess-Results. At the end of a very long day the likely winner of the 2011 O2C Doeberl Cup is still not entirely clear. GM's Andrei Deviatkin and Dejan Bojkov share the lead on 6.5/8, although they have already played each other. Half a point back are GM David Arutinian, GM David Smerdon, GM Sune Berg Hansen and Eugene Schon. As the final round pairings see Arutinian v Deviatkin and Smerdon v Bojkov the winning score will be either 7 or 7.5/9. The winner of the Hansen v Schon pairing also has a chance of finishing first, depending upon the other results, but the added interest in this game is a chance of an IM norm for Schon, if he wins. In the Major tournament there are still 9 players in with a chance of first place. Three players (Cloudsdale, Savige and Huynh) are on 5/6, with a further 6 players on 4.5. A draw on the top board opens the door for a possible 6 way tie for first! The Minor is a little more straightforward with Peter Grinyer leading with 5.5/6. There are 3 players on 5/6 but a win or draw for Grinyer guarantees at least a share of 1st place. The final round for each of these tournaments begins at 9:30 am (AEST) and live coverage of the top 4 boards in the Premier, plus the tops board from the Major and Minor will be available on the tournament website. A quick win from the lower boards in round 7 of the 2011 O2C Premier. There is no explaining chess players. Last years Doeberl Cup Lightning event was a raging success, with 83 players and a host of GM's/IM's. This year, with the same format, same prizes, and same entry fees, the field was only 45 players with 2 IM's and 2 FM's taking part. The top seed was IM George Xie who made a special trip down from Sydney to take part (he passed on this years Doeberl Cup Premier). However an early loss to Blair Mandla derailed his event, and he eventually finished outside the prizes. Instead it was 4th and 6th seeds James Morris and Jason Hu who tied for first with 8/9. Morris won the first place trophy on countback, as Hu's first round loss (followed by 8 wins) meant he played a weaker field. Blair Mandla finished third, with the various ratings prizes shared by groups of 4 and 5 players! Full results are available from the Doeberl Cup website. A number of people following the 2011 O2C Doeberl Cup have noticed that players are beginning to disappear from the pairings. The short answer is that they have either failed to turn up for a round or have decided to withdraw from the tournament. At this point ErikTeichmann, David Hacche, and Colin Finlay have decided not to finish the event. The policy of the Doeberl Cup organisers is to make no distinction between approved or non-approved withdrawer's. Instead we treat all players that pull out the same, regardless of the reasons. The next time they wish to enter the event they will be required to pay a 'forfeit' bond. If they then complete the event the bond is refunded, otherwise the organisers keep it (and increase any future bonds/penalties). As much as the first day of the Doeberl Cup is when the big dogs come out to play, day 2 is when it really kicks in to gear as Australia's number one chess event. With the Major, Minor and Under 1200 events all starting, the venue was filled with 235 players of all strengths, shapes and sizes. After a brief opening ceremony, all the events began on time, with the third round of the Premier, and the first round of the other tournaments. After some upsets in yesterdays second round, the top boards had an us v them feel about it, with the higher seeded players facing a number of promising talents. However ratings don't lie and the top seeds picked up the points, although FM Akshat Khamparia did draw with GM David Arutinian on board 1. Round 4 then saw a number of top seeds come together, but whether it was the effects of the second game of the day, or just mid tournament caution, there a number of draws, resulting in a big group of players in joint first place. GM's Deviatkin, Bojkov, Smerdon, and Hansen were joined by FM's Illingworth and Akshat on 3.5/4. The first two rounds of the Major and Minor were also held, but with each field attracting around 70 players it is still early days. The 2 day Under 1200 event has already completed 3 rounds and Lance Chiddy, Rueben Nowak and James Ashton all have perfect scores. As I write this, the final games from round 2 of the 2011 O2C Doeberl Cup Premier are still in progress. Eugene Schon, who defeated IM Stephen Solomon in the first round, is still going around with GM Dejan Bojkov in a rook and minor piece ending. Further down GM David Smerdon is doing his best to conjure a win against Justin Tan, while Tony Dowden is trying to mate with KNB v K against Bill Kerr. The day got off to a slower than usual start with a couple of no shows causing problems with the pairings. Pairings are published the day before the first round and aren't changed, unless a player finds themselves without an opponent. They then have the option to be re-paired against other players in the same boat. The two players most affected by this were Stephen Solomon and Eugene Schon, who were repaired against each other. (Both players wanted a game as a forfeit would invalidate any norms they might earn). It turned out to be a better pairing for Schon after he beat his higher rated opponent. Tomorrow sees the rest of the tournament kick off, with the Major, Minor and Under 1200 all starting at 1pm. Live games, results and pairings are all available from the Doeberl Cup website. The 2011 O2C Doeberl Cup Premier starts tomorrow at 1pm Canberra time. The pairings for the first round are already up (click here), with the usual caveat that the organisers will endeavour to re-pair players who find themselves without an opponent (due to no shows etc). There will be live coverage of the top 4 boards from the Premier, as well as the top board from the Major and Minor (which begin on Friday). Results and pairings will be posted on the tournament website, as well as video highlights from each of the rounds. I will also be blogging at the end of each day, and possibly doing twitter updates (if I can find the time). At the close of entries today there were 227 players entered in the 4 tournaments. This is down 10% from last year, although entries for the Under 1200 event don't close until Midday Friday. There are 71 players in the Premier, although the tournament has fallen just short of the 20 overseas players required to qualify it as an International Swiss. In practice this now means that players looking for title norms need to play at least 4 overseas players from at least 2 other federations (International swiss events are exempt from this requirement). When coaching at the local school's chess club, I try and keep things simple and understandable. As most of the kids aren't deep calculators, trying to explain that one side or the other one because of a deep combination doesn't always work. Instead I often treat demonstration games as little 'morality plays', where the loser did something 'bad' (in chess terms) and that is why they lost. For example the following game from the current US Championship shows Black being punished for (a) pawn hunting with the queen, (b) leaving the king in the centre, and (c) falling behind in development. But if I used this as an example game I would simply pose the question 'Which side moved the least number of pieces?'. Of course this is an over simplification (and I could find plenty of counter examples where the less developed side eventually won), but it at least drives home the message that trying to win with one or two pieces only helps your opponent. It is fair to say a Round Robin event is the best format to decide a champion. Some may argue that a Double Round Robin is fairer still, while Quadruple and even Quintuple RR's have been used in the past. But while this may be the 'fairest', it may not be the most exciting. If one player takes a big lead by the middle stages, the final rounds may be filled with quick draws at the top, and non-significant games at the bottom. This not only happens in chess of course, and is part of the reason why Australian (and US) sports have play-offs after the end of the regular season. Therefore it makes sense (kind of) that the US Chess Championship has once again used a divisional round robin system to guarantee an exciting finish. Instead of one big RR, there are 2 8 player groups, with the top 2 finishers from each group qualifying for the play off stage. This way the final games will be the ones to determine the champion. Of course the drawback of this system is that it shifts the problem of 'nothing' games to the start of the tournament. It also increases the risks of quick draws in the preliminary rounds as players concentrate on qualifying, rather than winning. So far 3 rounds have been played in this event, with Group A (headed by Kamsky) being fairly tight, while Group B (Sam Shankland leading this one) being a little more open. Full coverage can be found at the always excellent St Louis Chess Club site. It looks like FM Max Illingworth has picked up an IM norm at the just completed Thailand Open. He defeated Jarrod Neubronner (SIN) in the final round to have a PR of 2450+ and a share of 6th place. He drew with the 3 GM's he played including tournament winner Jan Gustaffson (2647). Gustaffson finished on 7.5/9, and shared first place with GM's Francisco Vellejo Pons and Nigel Short. IM James Morris also had a fine tournament finishing on 5.5/9, with a number of other Australian players (West, Reilly etc) finishing further down the field. On their return to Australia both Illingworth and Morris will be taking part in the O2C Doeberl Cup which begins this Thursday in Canberra. Final results from the Thailand Open can be found here. I suspect a decision by the Armenian government to introduce chess as a school subject for primary school students will begin the debate about what it might achieve. The general consensus from within the chess community is that chess makes us smarter. However what we think, and what non-chessplayers think, may not carry much weight without some objective measurements attached. I have a particular interest in the decision by Armenia, because chess is already a subject for grades 3,4 &5 at my childrens school, as well as being an elective subject for 6th grade students. Each class gets an hour a week of chess instruction, and the program has been running for a little over a year. While it is a popular program, and anecdotal evidence points to the students improving their problem solving skills and concentration levels in their other classes, the difficulty is measuring this improvement. Some ideas include comparing exam marks for classes doing chess against classes prior to the programs introduction, although discounting other factors may be difficult. Studying second order effects such as behaviour and attendance may also be possible (eg see if attendance levels are higher on days when chess classes are held). In fact it may may a good academic study to not only see it chess makes us smarter, but what metrics are used to measure this. The 2011 Thailand Open is set for an exciting finish with 2 rounds to play. Seven players are within half a point of the lead, with GM's Vellejo Pons and Gustaffson sharing first with 6/7. There is a big Australian contingent taking part, with IM James Morris having a fantastic tournament. He is on an undefeated 5/7, drawing with 3 GM's, beating 2 IM's and performing at 2502. FM Max Illingworth is also performing well and is still in the running for an IM norm. He is slightly short of the required performance, but a win in round 8 would leave him well placed for the norm. As the arbiters desk was located outside the playing hall, I didn't see the game played, but relied upon the winner to describe it to me. He finished his description with "and after Qd5 he realised that Nh6 lost a piece to Bxh6, as he couldn't take back as he was getting mated on f7". "Hang on" I said, "after you take on h6, he can castle and you still have to deal with cxb2." "Bc1" came the reply. "Not so fast, I'm pretty sure Black has something against that"
And indeed Black does. After 6. 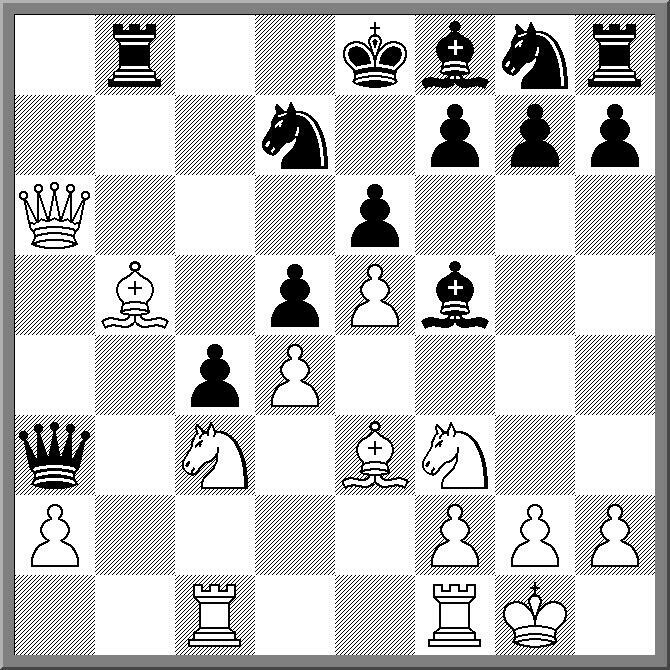 ... Nh6 7.Bxh6 O-O 8.Bc1? Nb4! Black is fact better, as 9.Qd1 c2! wins back the piece, while Q anywhere else allows Nc2+. But Black shouldn't feel so bad about resigning. He is in quite good company, including the game Mitjford v Scharf from the 1974 Olympiad. In fact of the 95 games I found in Hugebase, 12 of them ended with Black resigning after Qd5! But of the remaining games the results still favour White, even if he doesn't try and hang on to the piece with Bc1. Probably best is the direct 8.Bxg7 as after 8. ... Kxg7 9.Nxc3 White has a safer king and a lead in development. As reported last week, IM elect Andrew Brown has won the 2011 ANU Masters with a very impressive 8/9. As he had played his final game a week in advance, the interest in tonight's games was about who would take the minor places. Both Junta Ikeda and Andrey Bliznyuk had a chance for second place, with Ikeda starting half a point ahead of Bliznyuk. As it turned out, both players won (Ikeda over Ian Rout, Bliznyuk over Michael Reading) leaving Ikeda in second on 7.5/9 and Bliznyuk in third on 7/9. There was then a huge gap back to 4th placed Jeremy Reading, who beat Peter Pullicino to finish with 4.5/9. In the other game played, Adrian De Noskowski beat Miles Patterson to finish on 3 points. Full results from this event are available from the ANU Chess Club Webpage. Click on Current events. The chess website www.chess.com is organising an interesting event this Saturday. Rather than run an online event for its members (including me), it is encouraging us to met in real life. Via meetup.com, local events are being organised for chess.com members. A number of taking place in Australia, including one in Canberra. Given the event is scheduled for Saturday, holding it at the same time and place as Street Chess is a no-brainer. So if you are in Canberra, and you turn up for Street Chess you'll also be taking part in an online/offline activity. For further information there is a link in the twitter box on the top right of this page. One thing I've never understood is why chess beginners have a fatal attraction to moving the f pawn. While not all new players will do this, I've seen a number of games, either by new players, or by casual players in simuls, make an early move with the f pawn, only to get hacked by Qh5-f7. It is even move strange as one possible reason for moving the f pawn (to defend the e pawn), equally applies to pushing the d pawn instead.A similar phenomenon is that of the rook pawn push. Former ACT Champion (and Scientist) Ian Rout believed you tell whether a junior player was left handed or right handed by which rook pawn was pushed in the opening. He theorised that once a player had exhausted their 2 or 3 moves of opening theory, they simply moved the pawn that was (a) furthest away from the action and (b) closest to their dominant hand. Here is an example of how an early f pawn move can go horribly wrong. It was from the first round of the Dubbo Open, but amazingly it wasn't the first game to finish. The story behind that game is for another time. Junior player Wenlin Yin (ACT), has won the 2011 Dubbo Open. Starting the tournament as the 8th seed, Yin won all his games on day 2 to finish on 5.5/6. He wrapped up first place with a win over joint 5th round leader Allen Setiabudi in the final round. This left Setiabudi in 3rd place, with Dubbo local, Trevor Bemrose overtaking him with a final round win over tournament suprise packet, Jamie Lee Guo. Also in third place were Christopher Skulte and Matthew Bennett. Glen Qi (from Canberra) and Ramon Aich (from Dubbo) were the best placed Under 1400 players, while David Lanspeary and Jarrad Merrick were the best Unrated players. Apart from the Open, there was a handicap lightning event on the Saturday night. Despite being the top seed (and therefore conceding the most amount of time), Don Keast still managed to claim first prize (and a nice bottle of red wine) in the blitz. Full results from the tournament can be found here. The 2011 Dubbo Open got under way today, with a field of 48 players (exactly the same as last year). In the absence of last years titled players, this years event is looking to be a wide open affair. Despite this, the first round results were of a slightly curious nature, with every higher seeded player winning their game. Not a single upset of half upset. Round 2 almost followed the same script, with the higher seed player winning all but 3 games (which were all drawn). It wasn't until the third round that a few upsets crept into the crosstable. After 3 rounds only 2 player maintained a perfect score. Allen Setiabudi beat fellow Canberran Josh Bishop after sacrificing a piece for long term attacking pressure. Christopher Skulte almost missed his chance for 3/3 after misjudging the start time for the third round and turning up 25 minutes late. But then, with thing looking grim in his game against Mike Canfell, he benefited from an ill-judged winning attempt and quickly found the mating attack. Skulte and Setiabudi play in tomorrows round 4. There is a big group of player on 2.5/3 and a bigger group on 2. A full crosstable of this event can be found here. The 2011 Dubbo Open begins tomorrow, but the organisers are already confident that the tournament will be a success. Advance entries have passed the 40 mark, and a field of 50+ is a possibility. This years event could also be one of the most open in years as currently there is no one rated above 2000 in the field. If I was feeling egotistical I might call it "The Curse of Me", as when I play there is always a random IM/GM swooping in to clean up first prize, but instead it is one of those cyclical things that effect tournaments from time to time. Instead I'll be directing the tournament, and due to the marvels of modern technology, reporting the results from the venue. To this end I've added an extra link from the ANU Chess Club home page, titled Non ANU Events. Click on this to see the cross tables and pairings from the tournament. The discussion on tie breaks used for the 2011 European Championship is bubbling along over at Chessvibes. Of course the debate also covers what is the 'best' tie-break system to be used for various tournaments, a subject that is currently in front of the FIDE Rules and Tournament Regulations Commission. The major issue is how you differentiate between the performance of players that finish on the same score. The conventional wisdom for swiss tournaments, and one I agree with, is that the player that plays the harder field has achieved 'more' than the other players. The difficulty is what constitutes the 'harder' field. Now I don't have a problem with Sum of Opponents Scores (Buchholz) as the first tie break. Some may have a preference for Median Buchholz (drop the highest and lowest scoring opponent) due to the effect of first round pairings, but I'm not convinced it is a better system (your first round opponent may have a shocker, or may have a blinder, but then so may your second round or third round opponent). However one potential defect in the system is: What happens if one of your opponents plays a particularly hard field themselves (and consequently gets a lower score)? Now while this concerns another level of complexity, GM John Nunn proposed a solution a number of years ago. He suggested a Sum of the Sum of Opponent Scores. In fact he suggested (if I remember correctly) this could be extended further (using an averaging system) until everyone's tie-break scores stabilised. Interestingly I haven't seen this system formally proposed as an alternative system to the existing tie-break methods. Whether it is because it is seen to be too complicated I'm not sure, but at the next RTRC meeting I get to I'll try and find out. IM-elect Andrew Brown wrapped up the 2011 ANU Masters with a win over Adrian De Noskowski this evening. Although it is only the 8th round, Brown played his 9th round game against Alana Chibnall ahead of schedule, winning that as well. This leaves him on an impressive 8/9 and a full point and half against Junta Ikeda, who still has a game in hand. Ikeda moved to 6.5/8 after picking up an early pawn against Peter Pullicino, and then rebuffing an attempt to hack the king. Michael Reading salvaged half a point against Miles Patterson after looking like he was facing a lost ending, while Alana Chibnall continued her good tournament by beating Jeremy Reading after the latter got his pieces tangled up while trying for an attack. I've started working with a new coaching group this year and once again I face the dilemma about what approach I should take. It is a fairly young group (9 - 10 year old), but they all have some tournament experience. The choice (as I see it), is either to go with the flashy tactics, the brilliant attacks, the spectacular mates, or to try and develop a more rounded understanding of the game. The former is more appealing, as it is something that younger players seem to understand better (winning a piece makes more sense than controlling d5), and it is more likely to hold their interest. But in choosing this option I'm afraid they might miss out on developing a more general understanding of the game (as I did when I was younger). Or am I worryingly unnecessarily, and it is just a matter of making the information interesting and challenging, no matter what the subject is? Change is sometimes difficult to cope with, especially where chess players are concerned (try changing a venue for an established tournament and see how many fail to cope). So it isn't surprising that the current issue of New in Chess contains a number of letters complaining about the changes to the last issue of New in Chess. For those who don't subscribe (shame on you! ), the magazine simply changed size and now is in a larger format. The change makes it slightly harder to keep in your pocket, but on the plus size, the bigger layout makes it far easier to read. Along with the size change a couple of extra features have been included, but otherwise it is essentially the same magazine. So overall I like the change, and think the publishers have made the right move. There probably isn't such a thing as a perfect tie-break system. Some work better than others in certain circumstances, but fail in others. However, to at least try and make it work, an organisers should be (a) consistent and (b) publicise it well in advance. For example, the junior event I directed last week used what is the 'standard' tie-break system for ACT Junior events. In the event of a tie for first (or a title), the two highest players on countback (Bukhholz, Median Bukhholz, Progressive) first compare head to head, and if they either did not play, or drew, play a G/15m single game, with draw odds going to the player with the highest tie-break. While that loads the odds in favour of the player with the best tie-break, it does give the other player a fighting chance of winning the title (as indeed happened last weekend). This system has been in place for a number of years, and is reasonably well know (at least amongst players who have been involved in such ties). In contrast, the organisers of the European Championship sprung a new tie-break system on the players, one which the majority of players seemed to be unaware of until just before the closing ceremony. The tie-break (to decide qualification spots for the World Cup) had Tournament Performance Rating (TPR) as the first method. However this was modified to drop the lowest (probably good) and highest (probably bad) rated opponents from the calculations (including any points scored). This had the effect of dragging down some TPR's of players who defeated their highest rated opponent (eg Gawain Jones against David Navarra). In the confusion it appears that some players believed they were off to Russia for the World Cup, only to find out later they weren't. I guess the European Chess Union will eventually be the final arbiter of the results. It is a very rare game where I can follow a single plan from (almost the) start until the finish. Normally such plans will either be undone by my opponents own plans, or by me deciding I've found a better one (which often isn't correct). I did get to play such a game last week in a rapid (G/20m+10s) tournament at my club. As early as move 10 I envisaged a minority attack, doubling my rooks on the c file and then playing a5-b4 to wreck White's pawn structure. I even won a pawn due to to White's misplaced rooks. However chess is still a touch game, and having won the pawn I still needed to win the ending. In fact I almost mucked it up, and was fortunate that I had the f6 idea in the position. Despite being found guilty by the French Chess Federation of cheating at the 2010 Olympiad, Sebastien Feller is currently playing in the European Championship, as he is appealing the decision, and the punishment handed down is therefore on hold. Clearly the case (and possibly Feller's presence) is having an effect on others players, as an open letter, signed by many of the participants, appeared part way through the tournament, asking the organisers to take harsher actions to prevent cheating. The letter asked that arbiters be allowed to search players, to ban all electronic devices from the playing halls, and to unplug DGT boards if a player requests it. Interestingly the prime mover of the letter was Francisco Vellejo Pons, and it appeared the day before he was due to play Feller! Nonetheless it was signed by other players in the event as well. While it is clear that the players are concerned about (a) cheating or (b) being worried their opponent is cheating, I have two points to make. Firstly, demands to 'do something' can often lead to unintended consequences (ie players being disqualified for accidentally leaving a switched off phone in a jacket) , and secondly, a determined cheater will try and find a way around the restrictions. Having said this, it doesn't mean organisers should do nothing. At this years Doeberl Cup, we are taking steps to deal with the possibility that cheating may occur. It won't be as draconian as metal detectors and body searches, but it will include prohibitions on talking to people with laptops/computers in front of them, as well as a high degree of vigilance from the arbiting team. Of course this is pretty much what we've done in previous years (although the laptop rule is new), but in the current atmosphere it will hopefully allow players to concentrate on their games, rather than what their opponent may or may not be doing.